Punctuating the barrenness of the Great Indian Thar Desert, a plethora of fairs and festivals add colour to the lives of the people of Rajasthan. They have some or the other festivities going on throughout the year which they celebrate with great enthusiasm and passion. Different regions of Rajasthan have different rituals and traditions which they follow with immense joy. If one city is famous for a cattle fair, the other one boasts of exciting literature festival and yet another attracts people from different religious backgrounds during the Urs Fair. All the fairs and festivals of Rajasthan are marked by different kinds of dance and music performances. Not only this, the fairs and the festivals bring with them a great opportunity for the tourists to know the true colour of Rajasthani culture. The local people fix several food stalls in the fairs where you can dig on traditional Rajasthani food. Scan the small stalls here for funky jewellery and beautiful handicrafts. Pushkar Fair It is the largest cattle fair in the world. It is held in November every year attracting maximum number of visitors as compared to the other fairs of Rajasthan. In this festival commercial dealing of cattle, especially camels, is the main highlight. Elephant Festival is an interesting festival celebrated on the occasion of Holi between Feb-March. Come and see several elephant sports here. The participating elephants come in their best of attire. Desert Festival: It is celebrated in the golden city of Jaisalmer and is a wonderful celebration on the desert sands. Camel races and competitions are the main highlights of this festival. It is held between January-February. The mesmerising Sound and Light show is the last item held on the last day of the festival. 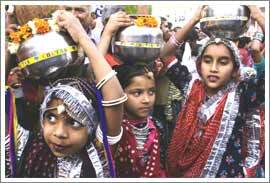 Gangaur Festival It is especially a women festival dedicated to the worship of Lord Shiva and his consort goddess Parvati. During this festival the married women pray for long and healthy life for their husbands. And the spinsters pray for a life partner who is like Lord Shiva. Marwar Festival is dedicated to the mind-blowing dance and music performances of the Marwar region. Urs Ajmer Sharif: This festival is held in Ajmer in the memory of the revered Sufi Saint Khwaja Moinuddin Chisti. It is believed that if you offer prayers from the core of your heart at Dargah Sharif, you prayer will not go unanswered. People from all over the country flock to the Dargah during the Urs festival. Which festival would you like to participate in?